Are you attending DockerCon 2017 in Austin, TX next month? If so, I invite you to add appLariat to your MUST SEE list of vendors. The folks from appLariat have some really amazing technology to show off. What's even more amazing, they are just getting started! DockerCon 2017 will become the launching pad for the company and its product offering, so you will definitely want to swing by their booth to learn more and see it in action. Read VMblog's exclusive pre-show interview with appLariat to learn what they have planned for the upcoming event. VMblog: Will this be your first DockerCon event as a sponsor? appLariat: Yes, this is our first time and this is our company and product launch. VMblog: Congrats on the coming launch! How many of your team will be attending? appLariat: We have a Silver sponsorship, so we'll have a 10x10 booth at the show and we'll be sending 3 employees, as well as some customers and advisors. VMblog: Talk a bit more about your booth setup. I'm curious, do you have a booth theme? appLariat: You'll see a container ship yard as part of our booth graphics and it is a metaphor for what appLariat does. You can think of the oceans and other waterways that container ships travel on to be clouds like Amazon Web Services, Google Compute or Microsoft Azure. You can think of the container ships themselves as container runtime environments like Kubernetes. They support the containers that represent application components. What appLariat does is automatically deploy a container runtime like Kubernetes (represented by the container ship) onto your choice of cloud (represented by the ocean). Then appLariat automatically "containerizes" your existing application (like loading the shipping containers) through a wizard-like interface and you can deploy them onto your cloud (represented in the metaphor as loading the containers onto the container ship) and manage them throughout the development lifecycle. VMblog: Wow, that booth theme and metaphor sounds really interesting! What kind of message can an attendee take back with them to sell their boss on your technology? appLariat: The easiest way to sell it to the boss is based on cloud infrastructure cost savings. Our customers save 30-50% on their Amazon Web Services bill through policy-managed deployments through appLariat. Typical payback on the appLariat yearly subscription is 3 months. Of course there is much more value provided by our container automation platform, however, that is the easiest ROI to sell. VMblog: In order to hear that message at the show, an attendee needs to visit you. Why should they add your booth to their MUST SEE list? appLariat: Because our solution is the only one that allows them to provide cloud native capabilities to their existing applications without the steep learning curve to move their apps to containers and deploy and manage a container runtime environment like Kubernetes. There are no Dockerfiles or Docker Compose files to manage, which means no file management nightmare and complete traceability of deployed apps to exactly what they are composed of (e.g. code, config and data artifacts, component versions and deployment styles, environment variables, ports opened, etc.). VMblog: Seeing as this is your first DockerCon. Why is this show a "must sponsor event" for your company? appLariat: Much like VMworld eventually turned into the biggest cloud infrastructure show, DockerCon is the premier showcase for what container technology can do for customers on both the Development and IT Ops sides. Since our product is all about allowing customers to get the benefits of container technology without the steep learning curve, we are really about simplifying and democratizing container technology. There is no better place to launch our company and product than at the premier container technology conference that has been growing 100% per year in attendance. VMblog: What should DockerCon attendees expect to see and hear at your booth this year? appLariat: They'll get to learn about and see demos of our new product, the appLariat Container Automation Platform. They'll get to learn how easy it is to move their applications to appLariat and get the cloud native benefits of portability, scalability and resilience, without the need for costly re-architecture projects or the steep learning curve to migrate to containers and deploy and manage a modern container runtime orchestration environment like Kubernetes. With appLariat all the complexity is abstracted and the solution works with your existing tools and processes. VMblog: The Container ecosystem is really growing. Explain to VMblog readers why your product should be considered unique. 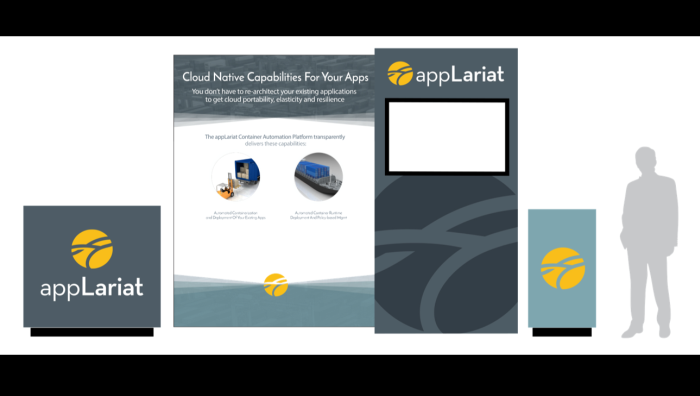 appLariat is designed from the ground up for bringing cloud native capabilities to existing applications. The products in the marketplace with some similar capabilities are focused on new micro-services based apps. With appLariat, customers can get cloud native capabilities for existing apps built with Weblogic, Websphere, Oracle and SQL Server. We focused on the front end process of converting apps to containers in an automated fashion, which no one else does. Other solutions rely on you to provide Dockerfiles and Docker Compose files, which means you have to accept the steep learning curve of learning Docker. appLariat provides a wizard like interface where the customer simply selects components from our library, configures the components, associates config, code and data artifacts to the components and appLariat automatically creates a containerized model of the app ready for deployment on Amazon, Google, and/or Azure clouds, or the customer's existing VMware vSphere environment. It takes just minutes to do this. While many products can automatically deploy a container runtime orchestrator like Kubernetes, appLariat also provides a policy engine that provides a control point for your orchestrator. While these orchestrators know "what" to do, they often don't know "when" to do it. The appLariat policy engine allows scaling up/down of apps and runtime clusters allowing customers to significantly reduce spend on cloud infrastructure. Our customers see a 30-50% reduction in cloud infrastructure bills with the appLariat policy engine controlling deployments and runtime cluster size. appLariat: Getting feedback from the attendees (prospects, press, analysts and other ecosystem companies) on our solution. VMblog: What would you say to prospective attendees who are thinking about attending DockerCon but aren't sure if it's worth it or not? appLariat: If your company is looking to move apps to the cloud, containers are the most portable way to do it. DockerCon is the premier event for learning about containers, so you really MUST be at this conference. You'll learn from customers, vendors and other experts. VMblog: What do you hope to come away with from exhibiting at DockerCon? What does event success look like to you? appLariat: Success to us means staking appLariat's claim in the container space, clearly establishing our differentiators and generating some enthusiasm about what we're doing. This show is about awareness for us, not customer acquisition. VMblog: Attendees always enjoy a good trade show tchotchke. Are you guys giving away anything special or interesting? 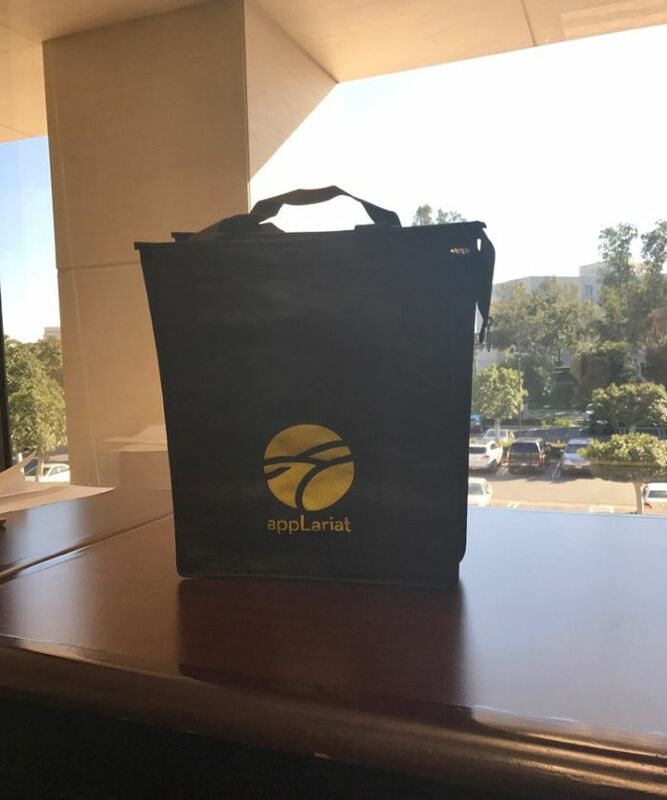 appLariat: Yes, we've got these awesome reusable, zippered, expandable, insulated shopping bags we'll be giving out to anyone who comes by our booth. They are black with our symbol/logo on the front. Very usable! VMblog: And finally, what do you think we need to do collectively as an ecosystem to strengthen the industry? appLariat: We must do more to remove the steep learning curve for getting started with containers and modern container runtime orchestrators for existing applications so that container technology can "cross the chasm" and be adopted by early and late majority companies. As you build out your schedule, make sure to save some time to visit with appLariat. You won't be disappointed!